This article is about a mountain pass in Colorado. For the C.W. McCall song and album named for the Colorado pass, see Wolf Creek Pass (album). For the pass in Utah with the same name, see Utah State Route 35. Wolf Creek Pass is a high mountain pass on the Continental Divide, in the San Juan Mountains of Colorado. 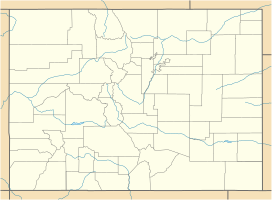 It is the route through which U.S. Highway 160 passes from the San Luis Valley into southwest Colorado on its way to New Mexico and Arizona. The pass is notable as inspiration of a C. W. McCall song. The pass is significantly steep on either side (6.8% maximum grade) and can be dangerous in winter. There are two runaway truck ramps on the westbound side for truckers that lose control of their brakes. View to the south into the snaking West Fork of the San Juan River as seen from US 160, halfway up to the pass. The tunnel on the east side of the pass, opened in 2005. Wolf Creek Pass, once a two-lane road winding through the San Juan Mountains between South Fork, Colorado and Pagosa Springs, has recently[when?] been expanded into a multi-lane highway, greatly increasing the traffic capacity of the pass and making it more navigable in bad weather. It will also become the easiest access to southwest Colorado from the rest of the state, as all remaining overland routes require lengthy detours through New Mexico or over Lizard Head Pass, near Telluride, or the intimidating Red Mountain Pass: a two-lane road winding along sheer cliffs from Ouray to Silverton. A 900-foot (270 m) tunnel on the eastern portion was opened November 5, 2005. Construction was completed in the Summer of 2006, with the highway fully widened and drainage projects along the route completed. The pass is also home to Wolf Creek ski area located on the eastern side of the Continental Divide on Highway 160. Also on the eastern side is one of the largest RV parks in the United States, located just a few miles west of South Fork, Colorado. Wolf Creek Pass is also an attraction for tourists, as it is known for the natural beauty of the wilderness the highway passes through. Just west of the pass, Treasure Falls offers passersby a view of a mountain waterfall. For decades, a major resort project proposed by Texas billionaire Red McCombs has been causing controversy in the area. The proposed resort would be situated near the summit of the pass and support over 8,000 people. People familiar with the high alpine environment and water issues in the area question the wisdom of a resort style village at 10,000' elevation. McCombs has been working with the Forest Service to acquire highway access to the property, which is an inholding. Over several decades the Forest Service has been the target of multiple lawsuits from community groups for incompletely assessing the environmental impacts of approving a highway access point to the property and withholding information requested through the Freedom of Information Act. Following the most recent lawsuit, the developers reached agreement not to break ground at the site until the case is resolved in court. Opponents of the "Village" state that the development would likely harm a vital wildlife corridor between the Weminuche and South San Juan Wilderness areas, alter backcountry experiences on Wolf Creek Pass, compete with local businesses in nearby Pagosa Springs and South Fork, adversely affect rare fen wetlands, and stress water supplies in the Rio Grande watershed. Proponents claim the "Village" would improve the economics of the region. Wolf Creek Pass was made famous in 1975 by country music artist C. W. McCall's spoken word song of the same name, in which the pass is described as "37 miles o' hell -- which is up on the Great Divide." The song describes the truck careening down through a "tunnel" (during which process several crates of chickens stacked on the back of the truck are inadvertently lost) and eventually into a feed store in Pagosa Springs. ^ a b "B 162". NGS data sheet. U.S. National Geodetic Survey. ^ "CDOT Warns Truckers: BEWARE THE WOLF" (Press release). Colorado Department of Transportation Region 5. 2017-06-15. ^ "A Beer Truck Had To Take A CO Runaway Ramp". 94.3 X. 2017-07-17. ^ "The Village at Wolf Creek". Retrieved December 18, 2015. ^ Blevins, Jason (June 29, 2015). "Village at Wolf Creek opponents sue to undo Forest Service land swap". The Denver Post. Retrieved December 18, 2015. ^ Marcus, Peter (June 24, 2015). "Village at Wolf Creek faces hurdle". The Durango Herald. Retrieved December 18, 2015. ^ Grover, Hannah (November 8, 2015). "Extension granted in Wolf Creek lawsuit". Farmington Daily Times. Retrieved December 18, 2015. ^ Blevins, Jason (December 18, 2015). "Deal delays start of Village at Wolf Creek construction". The Denver Post. Retrieved December 18, 2015. ^ "SJCA Guide to Wolf Creek". San Juan Citizens Alliance. Retrieved December 18, 2015. ^ Barber, Megan (December 3, 2014). "Plans Move Forward on Controversial Village at Wolf Creek". Curbed Ski. Retrieved December 18, 2015. ^ "Seasonal Temperature and Precipitation Information". Western Regional Climate Center. Retrieved November 18, 2013. This page was last edited on 8 March 2019, at 03:32 (UTC).